The Taransay Fiddlers have returned from the Island of Taransay where the inclement weather was of no consequence to a very busy and sucessful week. Chaiman Dolan Morrison reports that this years camp was the largest to date with a total of ninety on the island for the camp.Many of this years students were younger players which is very encouraging for the future of traditional fiddling in Lewis and Harris. Many extra activities took place including a historic walk,golf tournaments,fishing trips,the annual football match between the Hebrides v Rest of the World.a ceilidh and dance on Taransay and many sessions.Ian Macfarlane from Lochaber took command of the Melodeon class which this year had five students.He taught two Gaelic airs and three pipe marches for the melodeon class. Participants this year came from Galacia,Spain,Auckland New Zealand,Melbourne Australia,Christchurch,New Zealand, as well as England and all regions of Scotland and the UK. The tune writing competition this year was won again by Robbie Leask of Shetland.Robbie is making a habit of this and is a very competent composer.Local ladies Isobel Macritchie and Catherine Murray organised the catering to the highest of standards. Fiddle guru Charlie Webster from Abriachan attended the camp and his fiddle surgery proved very successful with fiddles being tweaked and bows being repaired.We thank Charlie for coming to Taransay and assisting the tutors with their fiddle concerns. Wolfstone fiddler Duncan Chisolm attended also and he proved he is a handy golfer as well as a fiddler.A big thank you goes to Duncan.Catriona Watt from stornoway sang for us at the concert on the thursday night.Catrionas` first ever public appearance was at the first ever Taransay fiddle camp so it was nice to see her at the camp again. The final concert on the Friday night in Tarbert Community Hall was sold out with the students and tutors playing to a full house. Performers included Lynsay Macritchie,Charlie Mackerron,,Andy Thorburn,Alistair White,Gillian Johnson with Margaret Mellon, The Taransay Gaelic Choir ,Corran Raa,Lachlan and George from down under,The box doctors,Gema from Galacia, and all the Taransay Student Fiddlers.A special thank you also to Stuart Macaulay from Stornoway for playing the big pipes at the concert on thursday and friday evenings.A very fine piper indeed. The Gaelic choir performed the Harris anthem “Chi mi ‘n tìr ‘s an robh mi na m’ bhalach” (I see the land where I was a boy). Sandra Mackerron and Andy Thorburn again did a wonderful job with the choir in such a short space of time. Tutors this year included,Lynsay Macritchie,Allan Henderson,Ian Macfarlane,Patsy Reid,Andy Thorburn and Alisadair White.This was Lynsays first year as a tutor and by all reports from the students she did a wonderful job.She has been attending Taransay since the very beginning.Fidhleirean Eilean an Fhraoich would like to thank all the volunteers studenst and sponsors ,Hebridean Transport,Hotel Hebrides,Brownie Morrison Tarbert,Willie Macrae,The Mackays of Horgabost,and Al Crae. 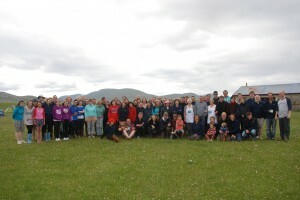 Feidhleirean Eilean an Fhraoich is a non-profit organisation which is committed to promoting the understanding and learning of traditional fiddle music through the support of fiddle instruction and related activities. Volunteers organize the Fiddle Camp, concerts, workshops. Our aim is to revitalise and nurture traditional fiddle playing in the Hebrides. Tutors this year included,Lynsay Macritchie,Allan Henderson,Ian Macfarlane,Patsy Reid,Andy Thorburn and Alisadair White.This was Lynsays first year as a tutor and by all reports from the students she did a wonderful job.She has been attending Taransay since the very beginning.Fidhleirean Eilean an Fhraoich would like to thank all the volunteers students and sponsors ,Hebridean Transport,Hotel Hebrides,Brownie Morrison Tarbert,Willie Macrae,The Mackays of Horgabost,and Al Crae. Go easy on the luggage. continues through to July.We are fully booked and some more. Here are the Taransay Ten Commandments for the benefit of you all. Taransay.email asap to dolanmorrison@tiscali.co.uk if not already done so. that thursday night will be Dance only at 8pm. Tuesday Night-Highland Games and Golf Tournament. tune if possible), Cabaret and Gaelic Choir. Any further suggestions are very welcome. 4-The boatman Capitan Macrae has asked if we could keep luggage to a minimum. recommended that you bring some food with you for saturday evening and sunday. 6-The bar will be charging £1.00 per drink throughout the week. daily just before the evening meal.Compulsory. island.With any luck we may have a tutor arriving sunday. 15.30 a free period for rehearsal,etc. Please note times are approximate. to meeting you all on the 18th. Author dmorrisonPosted on July 5, 2011 Categories News, Taransay News, UncategorizedTags 2011, NewsLeave a comment on Go easy on the luggage.